...And so shortly after taking office, I directed Leon Panetta, the director of the CIA, to make the killing or capture of bin Laden the top priority of our war against al Qaeda, even as we continued our broader efforts to disrupt, dismantle, and defeat his network. Then, last August, after years of painstaking work by our intelligence community, I was briefed on a possible lead to bin Laden. It was far from certain, and it took many months to run this thread to ground. I met repeatedly with my national security team as we developed more information about the possibility that we had located bin Laden hiding within a compound deep inside of Pakistan. And finally, last week, I determined that we had enough intelligence to take action, and I authorized an operation to get Osama bin Laden and bring him to justice. Today, at my direction, the United States launched a targeted operation against that compound in Abbottabad, Pakistan. I really don't think the stark differences between the two speeches requires any additional commentary from me. As you very well know, you selectively left a few things out, Paine. . . .Today, at my direction, the United States launched a targeted operation against that compound in Abbottabad, Pakistan. A small team of Americans carried out the operation with extraordinary courage and capability. No Americans were harmed. They took care to avoid civilian casualties. After a firefight, they killed Osama bin Laden and took custody of his body.
. . . After nearly 10 years of service, struggle, and sacrifice, we know well the costs of war. These efforts weigh on me every time I, as Commander-in-Chief, have to sign a letter to a family that has lost a loved one, or look into the eyes of a service member who’s been gravely wounded. So Americans understand the costs of war. Yet as a country, we will never tolerate our security being threatened, nor stand idly by when our people have been killed. We will be relentless in defense of our citizens and our friends and allies. . . .
"Tonight, we give thanks to the countless intelligence and counterterrorism professionals who’ve worked tirelessly to achieve this outcome. The American people do not see their work, nor know their names. But tonight, they feel the satisfaction of their work and the result of their pursuit of justice. "We give thanks for the men who carried out this operation, for they exemplify the professionalism, patriotism, and unparalleled courage of those who serve our country. And they are part of a generation that has borne the heaviest share of the burden since that September day. "Finally, let me say to the families who lost loved ones on 9/11 that we have never forgotten your loss, nor wavered in our commitment to see that we do whatever it takes to prevent another attack on our shores." What you've tried to do with this post, Paine, is as shabby as it is transparent. It's blatant intellectual dishonesty. You disagree with Obama about policy and don't like him, fine; that's your right. But do it honestly. Selective quoting like this is deliberately intended to mislead. It's lying. You can do better. Anderson, even with the additional parts of President Obama's speech you have quoted, and indeed even more so in parts of it, one finds the overall tenor and demeanor of it to be about HIM. Yes, he did make his obligatory comments of thanks to the intelligence agencies and military, but the underlying tone throughout was how HE did it and took the risks with this operation. Nothing of the sort can be found in George W. Bush's speech. I stand by the intent and integrity of the post accordingly, sir, and if you cannot honestly see that contrast between the two, then it is you who has lost objectivity, my friend. I agree with Anderson that you "should" have acknowledged that Obama shared the credit with the troops. The report you gave was not really balanced. However, it was a good point, either way. Obama did make it look like a little like the our intelligence and military personnel were simply responding to his direction like pawns while he strategized on how to catch a terrorist. Like all presidents, I am sure Obama mostly listened to those under his command as they presented options. He then he accepted the plan of someone he trusted. He was not the driving force. He was a passenger. He did not present it that way, so your post makes a good point. You failed to mention that if Bin Laden had not defeated Bush, Bush may have got him. In resignation, Bush decided we no longer needed to find Bin Laden, and besides, the grapes are sour. I don’t really think Bush’s record in Afghanistan is anything he would want to brag about. John Myste, you articulated the point that I was trying to make exactly, sir. 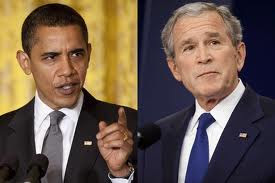 I understand that President Obama did indeed make the obligatory "thanks" to the troops, but the overall theme of his speech seemed to be in first person in contrast to that of President Bush's. Lastly, I have to concur with your assessment of Bush's record on Afghanistan too. OK, we get your point. Just let me point out we see Obama's first person "I" and "me" six times. The plural "we" and "our" and the "US" are mentioned eight times. Bless his collectivist little heart. "Anderson, even with the additional parts of President Obama's speech you have quoted, and indeed even more so in parts of it, one finds the overall tenor and demeanor of it to be about HIM." Actually T. Paine I find it more about his actions than about him. He wanted to carefully explain the genesis and outcome of this event because it involved a military action in an allied country. Remember that Obama was second-guessed on this action before the fact by John McCain and Mitt Romney and they were ready to pounce on any Presidential action - especially if it failed. If one is cynical enough, they can paint a picture anyway they want. George Bush gave a rationale to get Saddam by saying "He's the guy that tried to kill my dad". How personal and ego-driven is that? How many Americans were killed to avenge a assassination plot that may never even have happened? Obama made the final decision to send our brave men of ST6 in to what was a very dangerous situation. Had the operation gone south and ANY casualties of Americans occurred, Obama would have been raked across the coals for risking soldiers lives on a risky operation. Instead the operation was a success and had it been McCain elected instead of Obama, I seriously doubt there would be this whining about the credit.